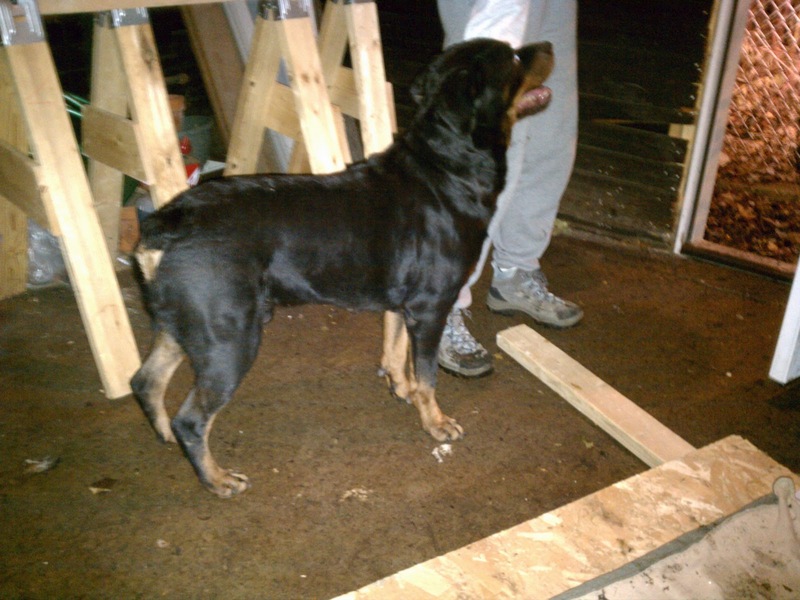 On Wednesday, a stray Rottweiler showed up in our alley. Since my wife was working at home, she got involved in trying to make sure its story had a happy ending. This is a synopsis of what we went through trying to do right by this dog, and all the confusion, misinformation, and apathy we encountered along the way. Ironically, the only way to ensure the dog's life would be saved was to get it to the one place we were certain was a death sentence: Chicago's Animal Control Center. Take it to your local vet and see if it has a chip. This might give you a fast track back to the owner, who will love you forever. Call 311 and request Animal Control to come collect it; if they come, make sure to tell them it's a stray, not yours. If they don't come, take the dog to your local police district and make them take the dog. They will try not to take it, because they don't want to have to care for the dog - too bad, it's their job. Contact the appropriate rescue agency and let them know that the dog is entering the system over the next 12-24 hours. They will watch out for it and make sure to collect it the day the dog's ownership reverts back to the city. 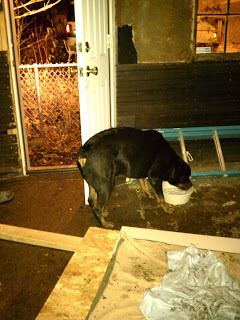 My wife and two other neighbors managed to trap the poor scared Rottie in a fenced yard, but the owner of that yard was very uncomfortable with his presence. She has no experience with dogs, and undoubtedly felt threatened by the "vicious killer breed" prowling around back there waiting for an opportunity to tear out her throat. She called 311, the Chicago non-emergency response number, and requested that Animal Control come collect the dog. She was unconcerned with what happened after that, of course, but in any case that is standard city procedure for any stray animal, so I can't really fault her. Animal Control rolled by the front of the house and didn't see the dog (he was in the back yard), and left. Further calls to 311 revealed that they may not be back for days. The yard owner called my wife, pleading to have the dog removed from her yard, saying, "I feel like a prisoner in my own house." You seem nice. Can I live here? My wife discovered that approaching with a Milk Bone and a leash was a good way to make a lifelong friend, and had no trouble getting the dog into our own yard. Then began a couple of hours of neighbor discussions and trying to find out if anyone who had a Rottweiler might be missing one. No luck, so she put an ad on Craigslist in case the owner looked there. The dog was proving to be very friendly and easy to manage, so she decided to walk him up to a local vet, Mayfair Animal Clinic, to have him scanned to see if he had a tracking chip and to get some advice. There was no chip, they discovered, but they gave her what seemed like obvious advice: Don't take this dog to Animal Control whatever you do - they'll kill him for sure. Now, bear in mind, this dog was not the stereotypical stray. For one thing, he was in great shape, maybe even slightly overweight. For another, he smelled like pet shampoo - that's not the aroma one associates with strays or abused killing machines. Finally, he would get really excited whenever he saw a leash, meaning he knew how incredibly awesome it is to go walkabout with a human. He immediately took to me, giving me kisses whenever he was able to sneak past my defenses. For lack of a better name, we started calling him Bob. He didn't really answer to it, but it beat "hey you!" It was warm that evening, so we set him up with a bed in the garage, and reviewed our options. 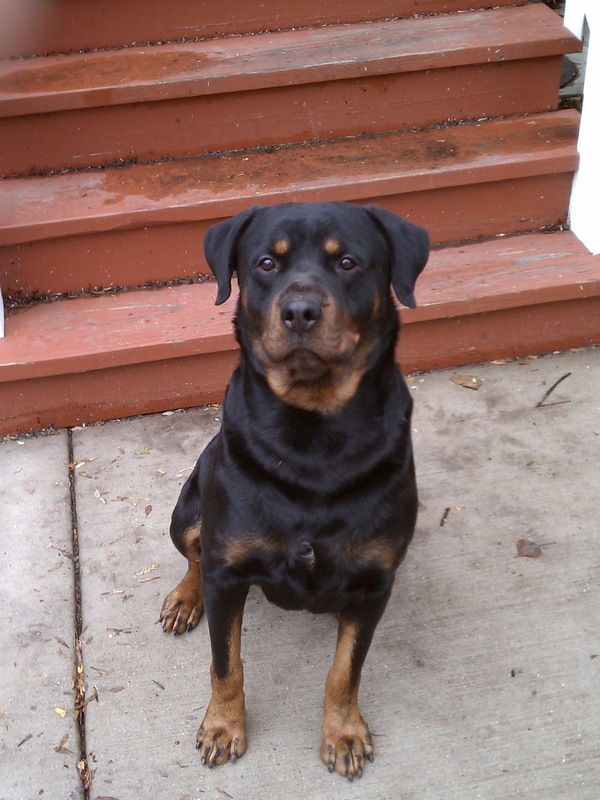 We have friends who work with Recycled Rotts, a greater Chicagoland rescue agency, and we figured that unless we could find the original owner, they were the best option. Failing that, we knew about one other rescue agency (THORR), and then PAWS or even the Anti-Cruelty Society were distant final choices. Beyond that we weren't even willing to contemplate; my wife put it succinctly: No one is killing this dog. So with this priority list in mind, we called our friend "Cindy" and asked her to use her contacts to get us in touch with the right people at Recycled Rotts (all personal names are changed here in case their owners don't want their privacy violated). We also called THORR and left a message, and my wife filled out a found-dog profile at the Illinois Lost Dogs facebook page. I also sent a description and pictures to Cindy's husband "John" so he could make sure they got passed along. It was getting on in the evening, so we weren't that surprised that no one called back. The next day, still no calls back by 10am, so she called PAWS and left a message. After still no response by anyone by noon, she decided to call 311 again and ask what to do. Note that 311 did not tell her to take the dog to Animal Control; instead, they said to call the local police district and fill out a report, since the owner might go there looking for his dog. She did, and the police took her report without telling her one very important piece of information: every police district in Chicago has the facility to safely and securely store stray dogs while Animal Control is called to come get them. That little gem would have saved us a trip the length of the city later. By mid-afternoon, we were both getting pretty desperate to find a safe place for this dog. The good luck with the weather the previous night wasn't going to hold: the temperature was dropping fast, and was supposed to fall well under freezing overnight. We discussed taking the dog in, but he wasn't very well-trained, and we have two (spayed) females: a greyhound and a beagle. That pair would be a recipe for trouble for a fully-loaded 100lb male Rottweiler. I got in touch with John again, and started pushing him hard. He and Cindy have taken Rottweiler fosters from Recycled Rotts in the past, and I was hoping I could get him to offer to take Bob from us; he wasn't willing to cave to that, but he did agree to pull some strings and get the president of RR to call us, "whatever it takes." Just like us, he thought the only way to guarantee this dog's safety was by getting it directly from our hands to Recycled Rotts' hands. 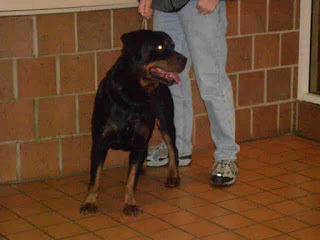 "Cathy" from Recycled Rotts did eventually call my wife, extremely annoyed that she had to interact with us at all. My wife is a saint, and if she describes someone as "snippy" on the phone, you can bet they were snippy and then some. 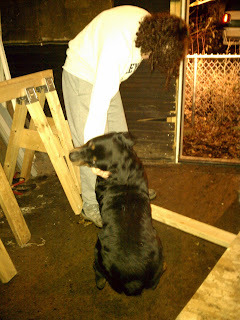 She asked for help, saying that we were desperate to get this dog somewhere safe and warm for the night. After brow-beating her for a while, Cathy eventually gave my wife a piece of information that would have saved everyone a great deal of trouble at the beginning: For legal reasons, rescue agencies cannot take stray dogs directly from the people who find them. The dogs must go through the City of Chicago (Animal Control) first, so that ownership of the dog reverts to the City; only then can a rescue agency claim the dog and get it into its foster program. Heck, it makes sense when you hear it snapped at you over the phone, but it sure would be nice if a single one of the agencies' websites would have that information on them. Or if 311 would have told us one of the times we called. Or if the local vet would have known and not told us to do the opposite thing. Or if one of the three different agencies we left messages at could have picked up the phone and gotten back to us to tell us this. Or if the police would have told us that, or told us to bring the dog by. But no, we had to manipulate friends and maybe damage their relationship with their rescue agency. THORR has never yet returned our call. I suspect RR wouldn't have either, without John's intervention. I begin to see why people tie stray dogs to the door of the local doggy daycare place. Oh boy, a car ride! The story gets happier from here on. That evening after traffic died down, we started attempting to get Bob into the Ford Escape so we could take him to Animal Control. He made it very clear he wasn't jumping in on his own, and Bob is 100 pounds (guesstimate) of solid Rottie. He thought I was pretty cool, but he was NOT OK with me trying to grab him and lift him into the truck. Finally, I ended up reinforcing a huge piece of plywood and turning it into a ramp. A Milk Bone later, Bob was making happy slurping noises in the back of the Escape. Bob drools a lot, and he really really wants to ride in the front seat. It was an interesting trip. I am ashamed to admit that I was expecting a clinical bureaucratic death camp filled with jaded hateful people, but Animal Control was a wonderful surprise. They treated us with respect, they treated Bob as well as any vet would, and they explained how the system worked and reassured us that there was almost no chance that Bob would be destroyed. They could immediately tell that he was a happy-go-lucky 100-lb idiot, not a threat to society; and as long as that assessment didn't change over the next 5 days, it was a virtual certainty that he would get scooped up into the rescue system just like we wanted. Recycled Rotts and other agencies tour the Animal Control Center on a daily basis, it turns out, looking for candidates. If they see a dog like Bob who fits the bill, they will either make a note of him and his release date or ask ACC to put a note on his cage to call them when he comes up for grabs. So Bob is in jail for the time being, but we're confident that his life is about to get much better. PAWS, Anti-Cruelty Society, THORR, and RR all have websites primarily designed to get people to take a dog. I understand that: they have more dogs than people to take them. But they, like us, are in this to save the lives, right? A simple How-To page on their website telling people what to do (and why) when they find a stray would go a long way. The Chicago Animal Control website talks about how many strays they take a year, and gives hours for dropping strays off, but doesn't explain how the system works. Every pet owner knows that Animal Control is a kill-shelter, so we assume it isn't safe to take someone's pet there. Every agency I called has a long outgoing answering machine message designed to discourage voicemail. It gives various tidbits of information so that most people will get their answer from the message and hang up. Add, "if you find a stray dog, we can't take it; take it to Animal Control instead." Is that so hard? It would be nice if the cops had been a little more service-oriented. Instead of, "yeah sure we'll take your report and file it under 'hopeless'," it would have been much better if the officer on the phone had said something like, "oh, you found a stray dog? if you can transport it here, we can get it into the right hands for you." Or even, "we'll send a car over to pick it up." Yeah, I know: fantasy. 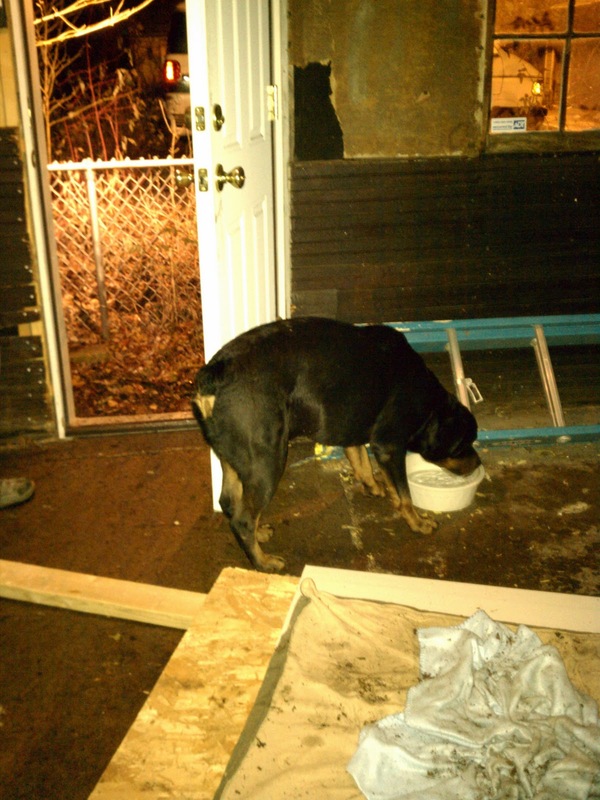 The Animal Control responder shouldn't have rolled by the house and left. If given an address and told the animal is confined, ring the damn doorbell. When vets in Chicago give out incorrect information, they cause a lot of harm. Mayfair Clinic was trying to help, but in the end they hurt the process. It doesn't seem unreasonable to expect a vet in Chicago to know how the stray dog system in Chicago works. I hope someone in our situation, searching the web for clues like we did, might stumble upon this blog post. If they only get as far as the "what to do" section at the top, then I have served my purpose. If anyone reads the story and gets a few chuckles picturing Bob's antics in the car, even better. And if the real message reaches even one person with the power to achieve one of the items on the list above, then I will be truly satisfied. Good luck, Bob. I hope you find a wonderful home. I pray, pray, pray that one of the rescues really does pick this guy up. Rotties don't tend to do well in confinement, and half the animals killed in this country's shelters now are purebreds. Thanks for giving it your best shot - and I agree, we'd all be better off if all the agencies involved would be honest and give information up front! I have been fostering dogs for a rescue group for a couple of years now, and your post makes a lot of good points. I have to share a caution, though... your advice probably gives any stray the best shot for getting into a rescue group, but there are no guarantees. Knowing about a dog doesn't mean a rescue will be able to take it, because there are only so many foster homes. They can't take in every dog that lands in a shelter - if they could, the shelters would be empty. And shelters are so very much NOT empty. When people find out I foster, they ask whether it's hard to give up a dog I've come to know and love. I tell them, that's not the hard part - I know that dog will be loved or I wouldn't approve the adoption. No, the hard part is the endless stream of Sophie's Choices - choosing which dog to pull from a shelter, while knowing that the ones you don't choose will, more likely than not, be euthanized. A quick update: Bob's five-day hold is up so I wanted to find out how he's doing. The petharbor.com website says to call Animal Control and give them his ID number. Unfortunately, this is not true at all. The only way to talk to someone there is to visit in person, and even then I don't know if I could ask questions or just be taken on the hourly adoption walk-through with everyone else. And I'm not sure I want to go down there and find out the story ended badly. Karen, you have my respect for fostering. That's a tough job. We know Bob's adoption isn't guaranteed. The only 100% sure way to save him would be to keep him or adopt him out ourselves, both of which were more responsibility than we wanted. Believe me, the decision to take him to Animal Control still weighs on me. It would be nice if we could just ask Recycled Rotts if they had picked him up, but what are the chances of getting that call returned? Nada, that's what. As a Rottweiller fanatic and a retired policeman, I think its a shame that you didn't just keep this poor dog yourselves. Likelihood is that he lived in your neighborhood. They tend not to stray too far but they do like to go for walks with or w/o their owners. Any dog owner in this day and age who fails to microchip their dog and who doesn't have him with a collar and tags, doesn't deserve to have such a beautiful animal. As for the police stations being equiped to handle stray animals that is not true. Most have only one, if any, broken and rusted old cages in the garage area with no food/water or blankets. Generally, one or more of the police officers out of their own funds will buy food for the animal but whether the dog will get walked or not is debateable. In the meantime the dog is left caged or chained in an area which is noisy and smells of gas fumes until someone remembers he is there. Best advice: DO NOT LEAVE AN ANIMAL WITH THE LOCAL POLICE STATION EVEN IF THEY WILL TAKE IT.